Frank I. Adams, 86, a retired Air Force Lieutenant Colonel who also had been a communications and electronics special projects manager with General Electric, RCA and Pacific Telecom, died Aug. 31 at the Virginian Health Care Center in Fairfax, Virginia. He had Alzheimer's disease. Colonel Adams, who had lived in Annandale for the past 36 years, was born in Windsor, Vermont, and raised in Richmond, Massachusetts. He graduated from the University of Maryland and joined the Army Air Corps in 1938. During the early years of his 23-year military career, he was an aircraft radio operator. He attended the Army Command and Staff College and, as a communications electronics officer, was stationed in Japan and Greece and at the Pentagon. He retired from the military in 1962 and spent the next 33 years as a communications and electronics specialist. After working for General Electric and RCA, he spent about 10 years with Pacific Telecom Inc. in Arlington before retiring in 1995. He was past president of the Independent Telephone Pioneer Association and a member of the Armed Forces Communication and Electronics Association. Survivors include his wife of 51 years, Anne C. Adams of Annandale; two sons, George Adams of Newport News, Va., and Glenn Adams of Fredericksburg; a sister; two brothers; three grandchildren; and six great-grandchildren. Who served with the United States Air Force for 23 years before retiring in 1962, died August 31, 2002 at The Virginian Health Care Center, Fairfax, Virginia. He had Alzheimer's disease. 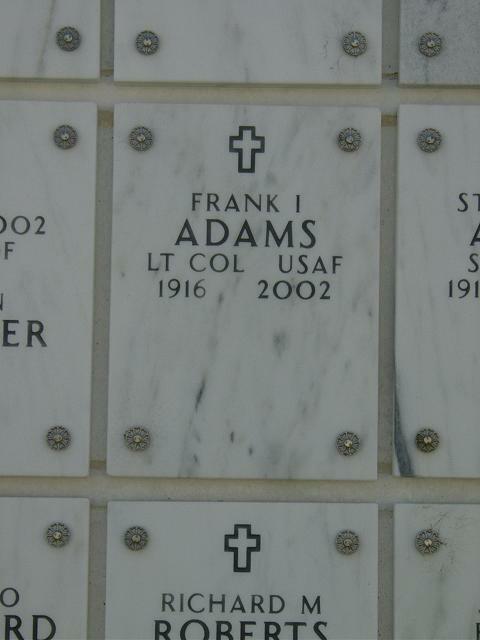 Col. Adams is survived by his wife of fifty-one years, Anne C. Adams; two sons, George of Newport News, VA and Glenn of Fredericksburg, VA; three grandchildren and six great-grand- children. Also, surviving are one sister, Virginia Mosher of Bellows Falls, VT and two brothers, Wallace Adams of Holden, MA and Arnold Adams of Sulphur Springs, TX. Family will receive friends on October 17, 2002, 1 p.m. at the Old Post Chapel, Fort Myer, VA. Interment will follow at the Arlington National Cemetery. Friends are invited to a celebration of life for Col. Adams following the interment at Spates Community Club at Fort Myer. In lieu of flowers, the family requests memorial contributions be sent to The Alzheimer's Association, National Headquarters, 919 N. Michigan Ave., Suite 1100, Chicago, IL 60611-1676, 1-800-272-3900.